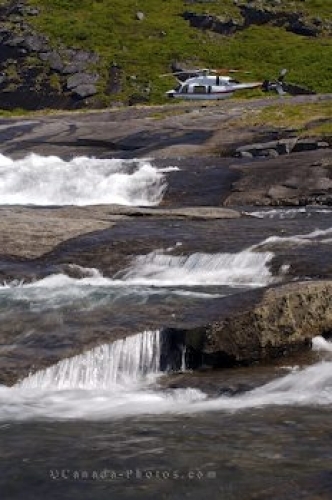 A waterfall cascades over each tier of rocks on the slope of the Mealy Mountains in Southern Labrador while leaving a flat surface above for the landing of a helicopter. From here, the passengers aboard the helicopter can explore the beautiful landscape of the Mealy Mountains. From this height into the Mealy Mountains, the scenery is breathtaking and the only sounds which surround you is the thunder of the waterfall rushing down and the calls of nature. The air is fresh and clean and the peacefulness of the area makes it hard for people to return to the busy sounds below. Waterfall with a helicopter in the background in the Mealy Mountains in Southern Labrador, Labrador, Newfoundland Labrador, Canada. Picture of a helicopter landing on the Mealy Mountains in Labrador near a waterfall.